Boggler Blogger: IsaiFM Musical Festival 2018!!!! One of the most talked about music festival in Malaysia, IsaiFM's Music Festival 2018 is happening tomorrow, and we can't express how excited we are for it to happen! For the first time ever, we are going to witness star studded celebrities like Oviya, Bigg Boss Snehan and nectar like voices from Masala Coffee and Haricharan. 100% entertainment guaranteed! Not forgetting Malaysian talents such as Psychomantra and Lock Up are joining hands to make the Music Festival a bigger, and better one! 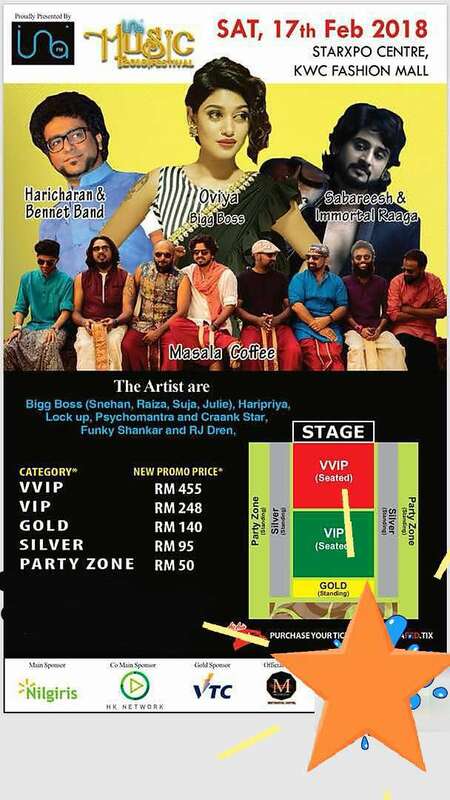 Instrumental geniuses such as Immortal Raaga is also going to be lighting the stage on fire. After all, the more the merrier, right? This 10 hours of non-stop musical feast is packing up some serious energy for the attendees and to value the attendees' hours of time spent at the music festival, there will be 1 person who is to walk away with a brand-new motorbike for the entry of contest run earlier during the promotional campaign. Tickets that range from RM 50 to RM455 are limited and is selling super fast! Have you gotten your ticket yet? If not, you may contact Miss Rathippriyah Balsan @ 010-22 1286 or Miss Raynuga Balsan @ 014-660 8659 to purchase your ticket now! Sweetening the deal, we heard there is a special offer going in right now. Why wait when you can an exclusive all rounder music fest for just RM50? 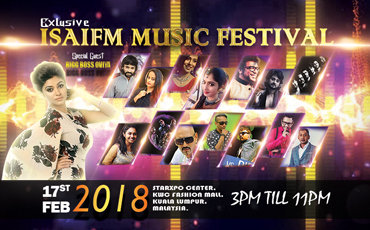 IsaiFM Music Festival 2018 is happening on 17th February 2018 at Starxpo Centre, KWC Fashion Mall. Don’t miss out on this amazing musical festival galore brought to you by IsaiFM.